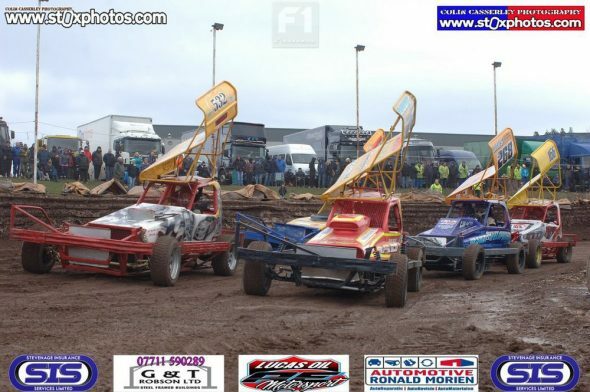 On then to Loomer Road for World qualifier number 7, at the unpredictable Stoke shaleway. I expected the place to be a mud-bath after the weather over the preceding days so it was a pleasant surprise to find the going good to firm with just a few puddles (mind you that was in the gents!). F1, F2 and Heritage “Golden Years” F1 cars were on the menu tonight. Ten non-starters meant just 31 F1 cars available so a two-thirds, all-in final format was chosen, 21 for heat one won by…21. 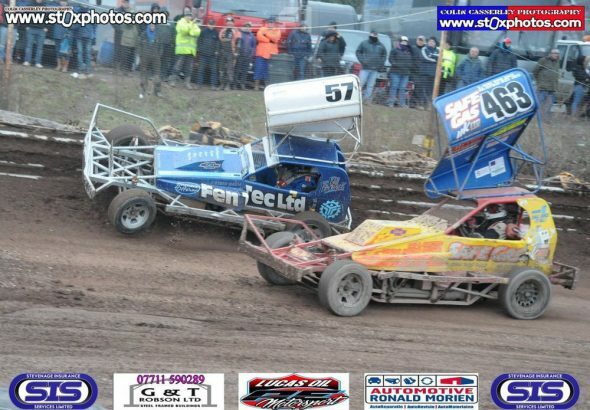 Bill Fenwick (57) led the early laps chased by the smart machines of James Bailey (135) and Daz Kitson (532) until Bailey threw a wheel at the infield. 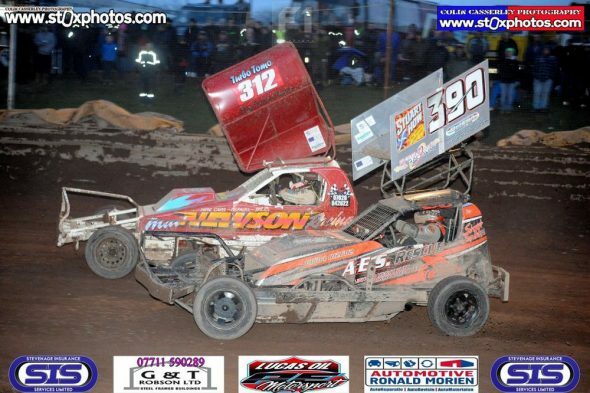 Kitson took over for a spell before Mark Gilbank hit the front, keeping clear of second-placed Will Hunter (220) with Stuart Smith (390) in third. 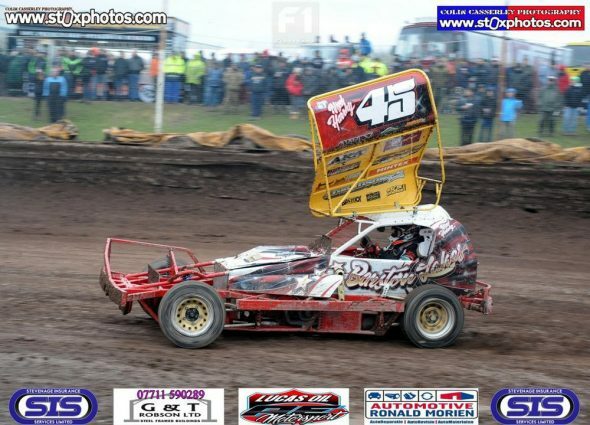 Mark Gilbank took the win in Heat 1. 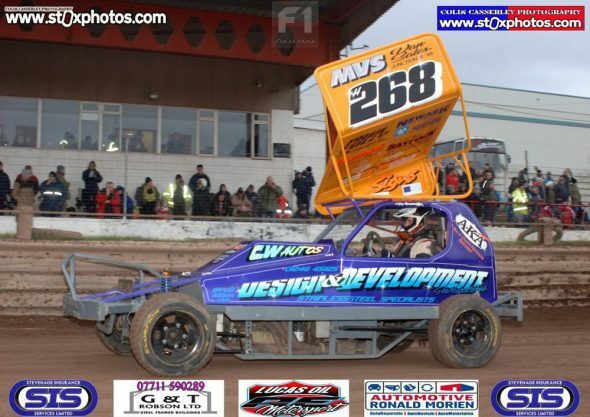 Nineteen for heat Two, last man on track being Frankie Wainman Junior. 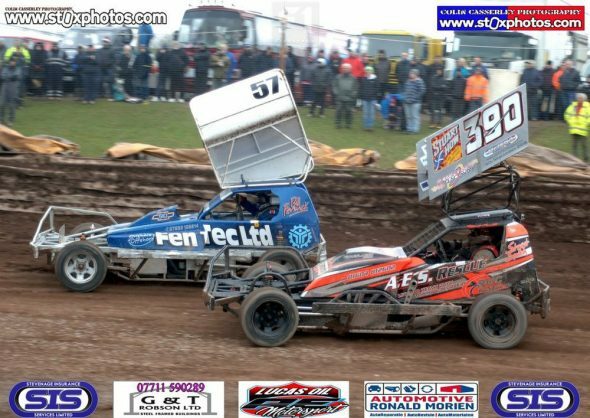 The 515 car was up on jacks pre-meeting with the floor out which to me indicated gearbox or clutch trouble and Wainman seemed to struggle in the early laps. 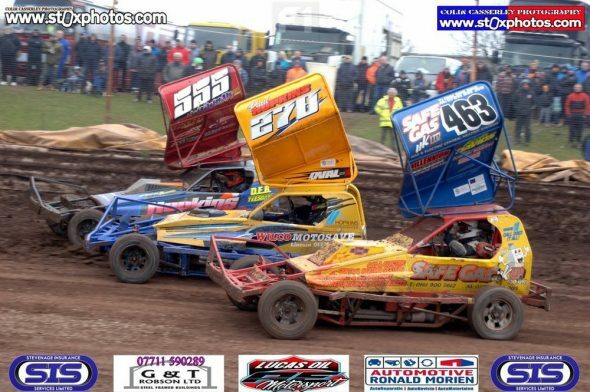 Dan Johnson (4) streaked through the field into sixth or seventh place, then locked up with James Neachell (322) on the back straight and slid onto the infield. Nigel Harrhy (45) now led but a caution for Neachell, hooked up this time with John Thompson (312), slowed proceedings down to walking pace. 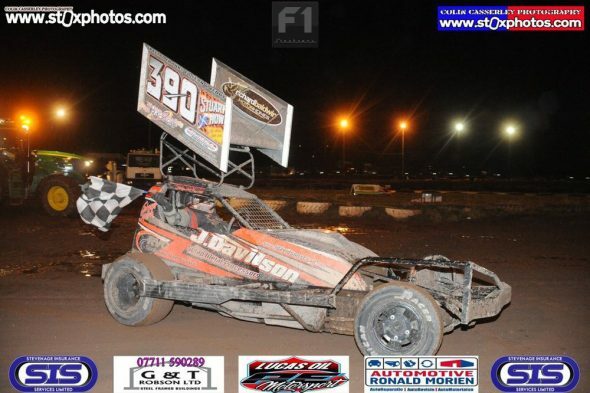 Was Nige on for another win? Eliot Smith (293) said no, punting the 45 car wide for the lead but slipping wide himself more than once as the track seemed to get stickier by the minute. Smith spun, Harrhy took the lead back and FWJ, after a couple of “almost but not quite” moments clawed his way into second, then took over at the front for the last five laps. 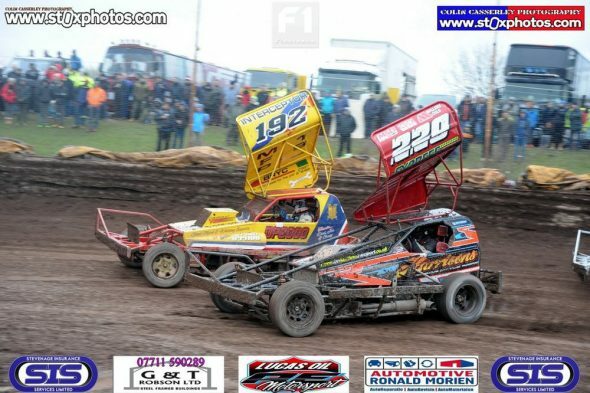 Hunter notched up another second place with Johnson third, Nigel hanging on to fourth to pocket a few more points. 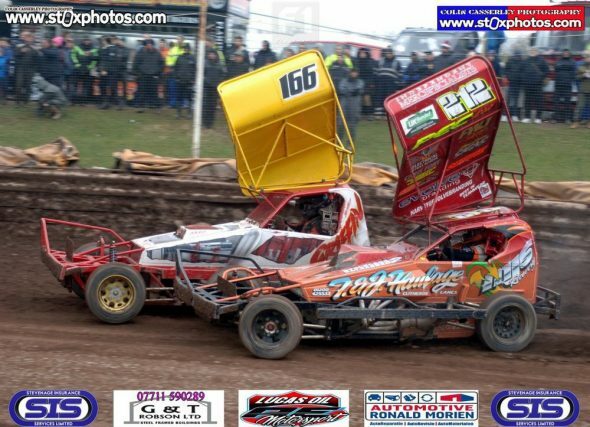 Frankie Wainman Junior on track with his daughter, Phoebe. 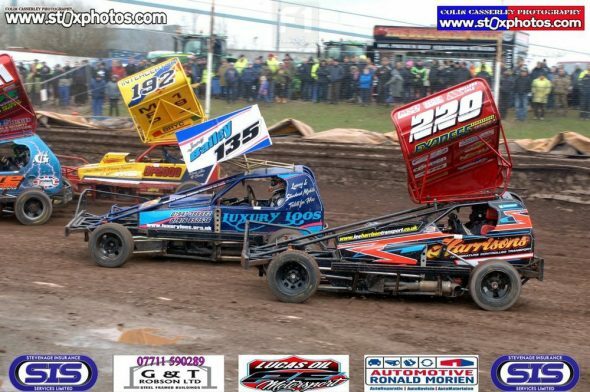 Eighteen for heat three with white topper Austin Moore (127) the class act in this one, taking an excellent third behind winner John Dowson Junior (94) and Stuart Smith, leaving Gilbank, Johnson, two Wainmans and a Harrhy in his wake. No mean feat. 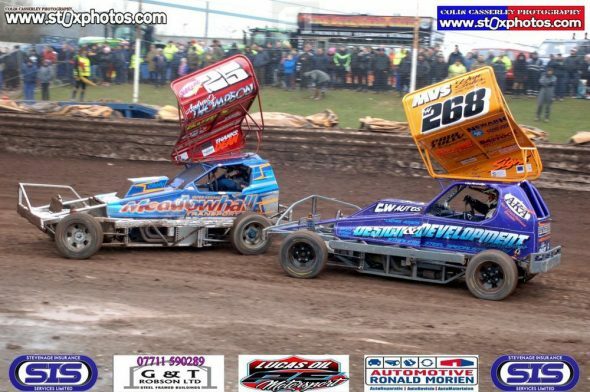 Twenty-eight for the all-in final, reduced to 26 when Hines and Harrison (25) returned to the pits before the start. 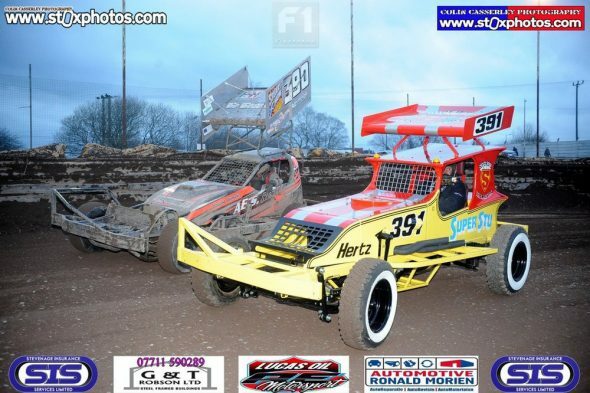 The replica “Hertz” 391 car led the rolling lap, then another lap before being shown the centre green and the race was on with Moore and Hassell (13) on the front row. A schemozzle on turn one saw several cars involved, bringing out the caution. 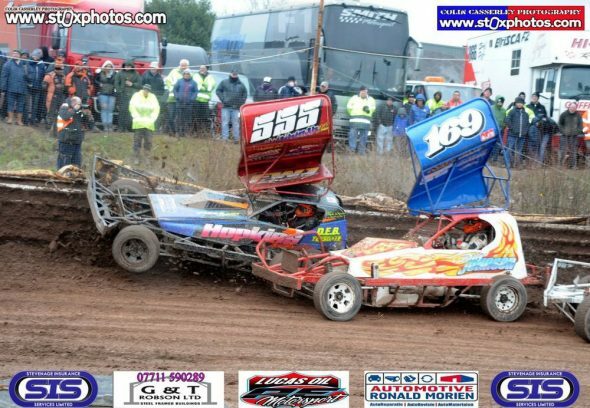 Did Smith welly FWJ into the pit bend under the yellows – maybe, maybe not? 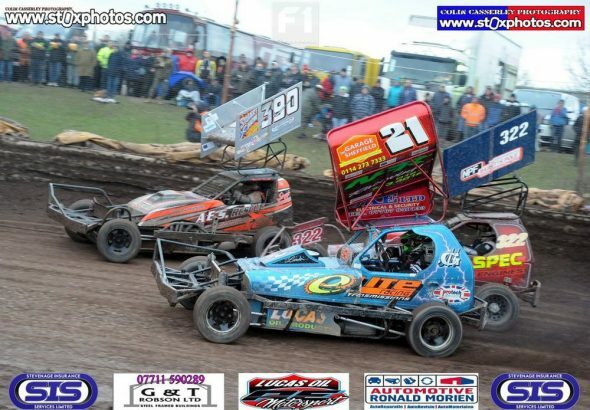 The caution was for number 13, clobbering 192 and needing a bit of tlc from the medics. Kelvin was shaken but not stirred (probably not the words he used) and his car moved from harm’s way before the green flag dropped again. 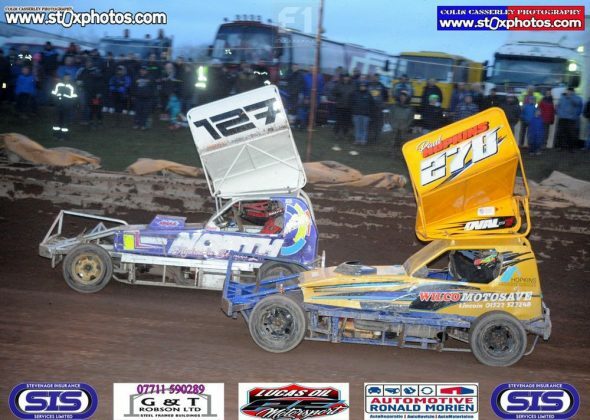 Moore again led, then Kitson, but Daz almost rolled on the back straight tyres leaving 127 back in front? 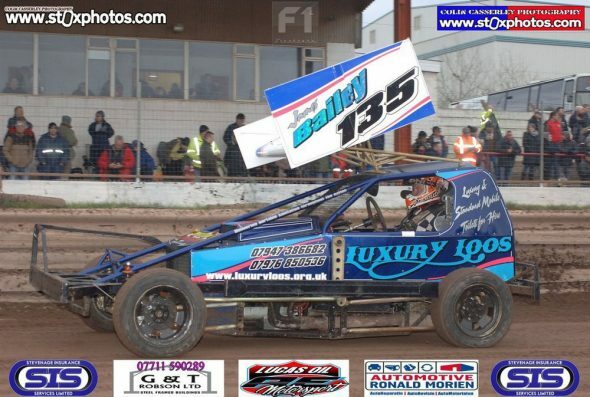 I felt Bobby Griffin (166) now had the lead with Smith up to fourth and FWJ fifth by the halfway stage. 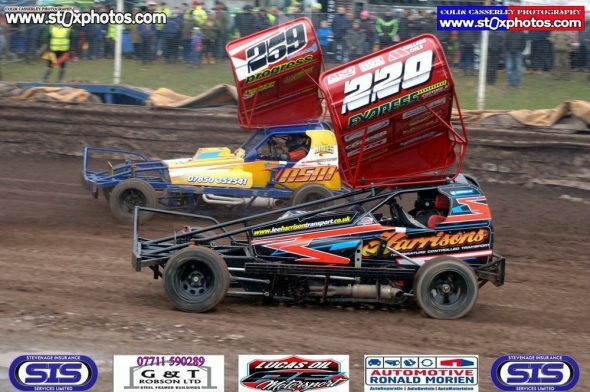 Did I mention Paul Hopkins (278) was second and going great guns? 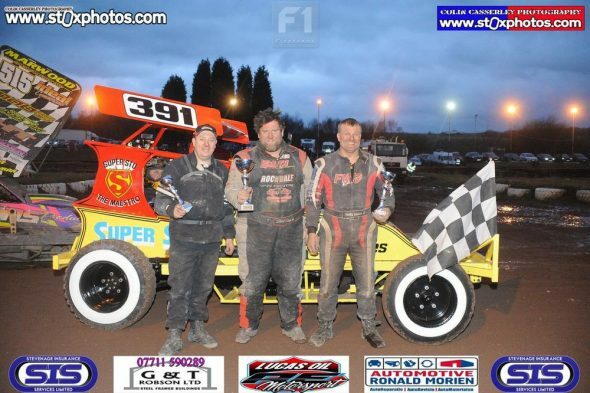 Smith removed Griffin from the lead with 515 in third, then second by the flag but there was no staying with the 390 car this evening, running out a clear winner over FWJ and Gilbank with Hopkins fourth. Early leader Moore came home in eighth, one of six lower grade triers in the top twelve. Nineteen for the grand national, with SSJ taking the one lap handicap off the front, but at the back, as it were. Moore again set the pace, but a very early caution involving 220 and 312 brought things to a halt. 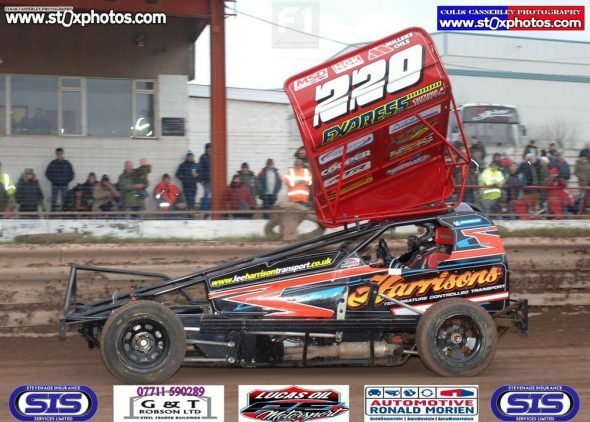 212 hit trouble at the restart and Smith, on another flier, put Wainman wide under the yellows as another caution cropped up. Stuart gave the place back but the way he was going the one lap handicap was no handicap at all. 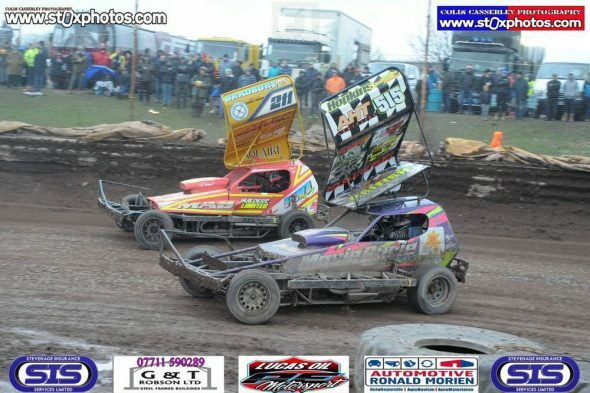 Just 13 for the restart as the dust began to rise with the 390/515 battle continuing. 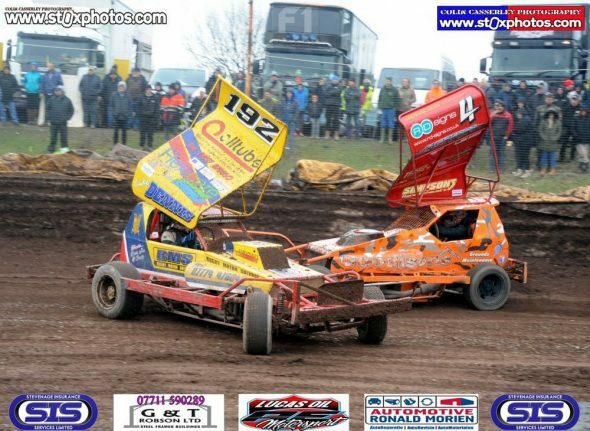 Another pile-up on the pit bend claimed a few but a near spin by Wainman on the pit bend settled the dispute in favour of Stuart, now third. Second placed Gilbank retired with a flat leaving Austin Moore still clear at the front by nearly half a lap but Smith was closing fast. 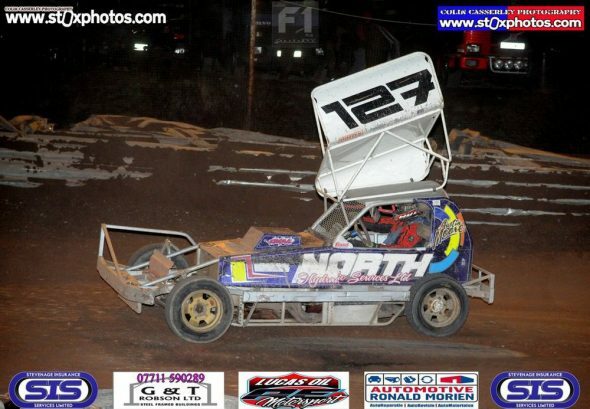 Five to run, four to run, three to run and Smith was there on the 127 back bumper. 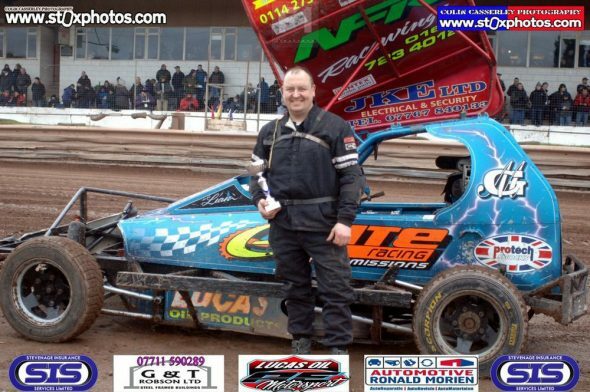 Moore let him go without a fight, settling for a marvellous second behind the Silver Streak with FWJ in third. 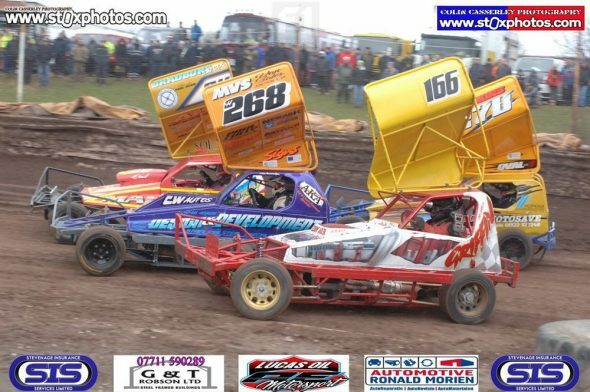 I cannot leave without giving credit to Mark Woodhull (335), on double duty in both F1 and the Heritage Nev Woodhull 43 car. It may only have a 4.2 Straight six Jaguar between the rails but he gave Mike Shirley (in the Ellis Ford 3 replica) a good run for his money in the opening race. Golden years, golden years ba ba ba… repeat to fade out.